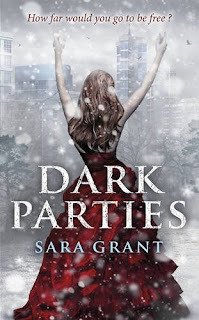 Dark parties is one of those books which will totally surprise you as it twists and turns in its narrative leaving you unsure at first about what kind of book it actually is. Neva is one of those characters you are meant to fall in love with meaning you want to get behind her and her cause completely which I totally did. She lives in this 1984esque world where people are controlled by the government in their every waking moment. History has been rewritten, people go missing never to be spoken of again and the youth of the protectosphere are encouraged to procreate like crazy to build up a dwindling population. Neva and her friends don't buy into this idea. They know there is lots that the government isn't telling them and are determined to find out more at the risk of being arrested or worse becoming one of the missing themselves. The main plot of the story follows Neva as she tries to find out more about the world she actually lives in. She risks everything to do so and ends up in several situations which are extremely nasty and unplesant and the price she pays for trying to uncover the truth is extremely high. There are several scenes which are truly horrific and show the complete power of the government over the people who live under them. The end of the book adds in several twists which I never saw coming and whilst ends the story quite nicely leaves lots of spoce for more books to follow on from it which I hope do follow in the future.